Schöne Luxus-Bergheim in Sundance. 20 Minuten nach Provo und 25 Minuten nach Park City, oder Ski nur Sundance Vorder- und Rückseite Berge. Phänomenale Architektur gibt sowohl die obere und die Hauptebene 20 Fuß Gewölbe. Drei Ebenen, drei Master-Schlafzimmer, drei Familienzimmer, die drei Ebenen der atemberaubenden Decks, zwei voll ausgestattete Küchen und eine volle Granit Bartresen. Voll raquetball Gericht unter der 4 PKW-Garage. Kletterwand an der Außenseite des Hauses, Ski in / Ski-out, Fahrrad in / Fahrrad aus. Sehr privaten Rahmen. Nicht ein Haus zu verpassen. Groß genug für große Familienfeiern und ganz privat auf allen Ebenen. Dieses Haus liegt 100 Meter von der Skipiste entfernt. Sie können zu Fuß laufen und zurück zum Haus fahren. Im Sommer können Sie ein- und aussteigen. Stewart Falls ist eine leichte Wanderung von der Hütte aus. Wonderful experience. Perfect for a family of 12 -13. We stayed for 3 nights. We all had plenty of room and the kitchen was stocked with everything needed to cook numerous meals. Adults had a great time bonding on the ski slopes, dining at the resort restaurants, and playing games around the fireplace. Fun to wake up to such beauty from every window! I miss it already. Very very dusty!!! We mopped the floor and wiped surfaces down before and during the rental. Kitchen sink was so clogged, disposal didn't work, and we finally had to unclog it ourselves in order to use it and to use the dishwasher. Overall, the house was comfortable,the amenities were fun, and the owner was easy to get in touch with. I was confused as to why we were charged two cleaning fees beforehand. One for cleaning service prior to our arrival and one for after our stay. On top of that, you have to place all the linen in the washers and fill the dishwasher then start them before you leave. This is a busy rental season and it is a very large house so deep cleaning and dusting only happens once or twice a month and they were at the tail end of a busy time where some dusting needed to be done. I was not aware of the kitchen sink situation and should have been informed and I could have fixed it. Guests are not charged two cleaning fees. There is only one. It isn't a hotel, you are staying in my second home so it is polite to pull the linens and load the dishwasher when you leave. Small group family reunion, and had a great time in a great location. No complaints, and hesitant to talk the place up too much, as we want to go back, and would hate to have created competition for next year. 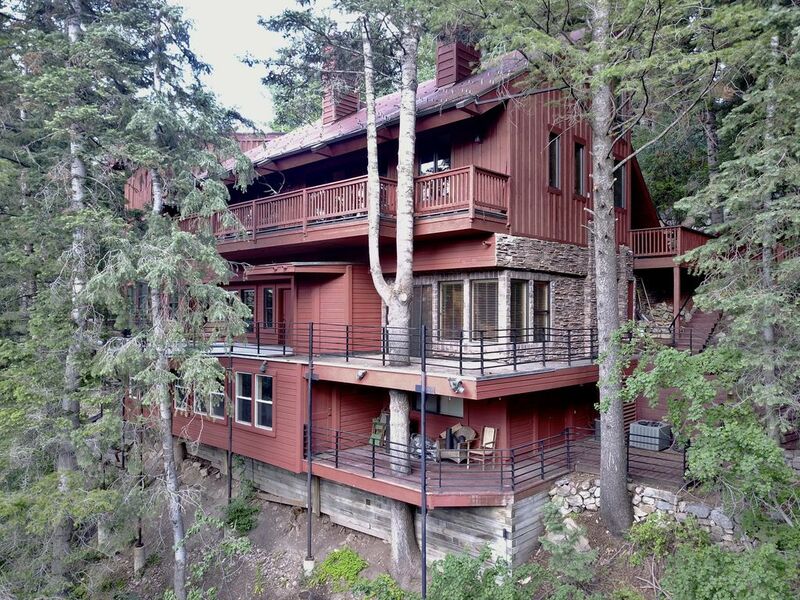 This is a gorgeous mountain home, walking distance to the Stampede run at Sundance resort. Perfect for multiple families with kids (NOT toddlers...too many stairs) vacationing together. Our grown up sons had a blast with the indoor racquetball court! One problem: VERY SLOW Internet. We rebooted the router, but to no avail. I had issues with the kitchen off the main living area...it was not clean. Superficially, OK....counters wiped....but filthy oven I had to clean before I could use it for our Christmas dinner; mouse droppings in the corner closet and in the pot I wanted to cook my potatoes in; dirty coffee pot with leftover coffee from the previous occupant; cobwebs in the ceiling; refrigerator didn't work which we didn't recognize at first so we lost a fair amount of our perishables; new items had to be moved to the other fridges in the house (where the milk then froze unfortunately), etc. Bathrooms were great. Hot tub was great. If you are visiting in the winter a 4 wheel drive SUV is a MUST: you will not be able to get to the house without one. The man I contacted for this property thru VRBO was great: very responsive (except for fixing the fridge: that never happened). I had asked if there would be a roasting pan at the house: a new one was on the counter when we arrived. I asked if there would be any Christmas decorations up; there was a full sized decorated tree for us! There was no wood for the fireplaces on our arrival; I contacted him and some wood was delivered the next day. So, while lacking detailed scrutiny by housekeeping, the house itself is gorgeous, nestled in the pine woods. PLUSES: Overall, this property is very nice. The 4-car garage, great racquetball court and hot tub are great features and the view is spectacular from the various decks. There are 5 double/queen bedrooms each with a bathroom attached, or in one case, right next door and plenty of lounging space. MINUSES: The two futons listed in the offering were not there, but instead there were a single and a queen size Aerobeds, with built in pumps that were adequate. That sleeps up to 13 with a few couches that are sleep-able. We were there in the heat of summer and found the air conditioners to be inadequate for the space. The lower level was not very clean on arrival and there are a number of bothersome maintenance issues that we had to work around. The kitchen is fairly well stocked but we needed and found no pizza cutter and no can opener. All-in-all it was very enjoyable. Sundance Mountain Resort ist ein Zentrum des Sundance Film Festivals und dieses Haus liegt in der Mitte des Resorts.